Congressional Republicans are having a hard time agreeing on how to reform health care, and it’s not clear what Congress will do next. In the meantime, insurers have filed their proposed rates for 2018 for plans in Tennessee’s healthcare.gov Marketplace. Premiums across the state are set to rise, and some counties may have fewer options. If Congress cannot agree on legislative changes to the ACA, Tennessee’s policymakers may want to consider the available state-level options and their trade-offs to reduce premiums and keep insurers in the individual market. Today, the healthcare.gov Marketplace covers just over 200,000 Tennesseans. That’s about half of Tennessee’s individual health insurance market. 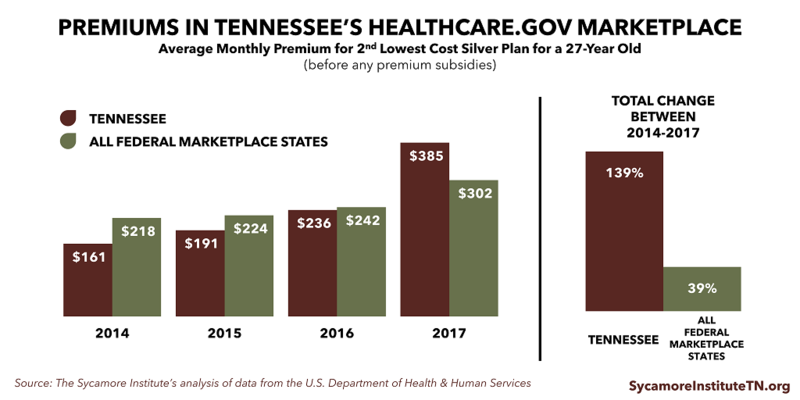 Since the Marketplace’s launch in 2014, premiums have increased faster in Tennessee than other states. The number of participating insurers has also fallen in most parts of the state. These factors have likely contributed to the decline in Marketplace enrollment from 2016 to 2017 (Figure 1). In 2014, Tennessee’s Marketplace plans had some of the lowest premiums in the country (Figure 2). As it turned out, insurers had set premiums too low to cover their higher-than-expected costs and reported large losses for their Marketplace products. Premiums nationwide began rising faster than expected. 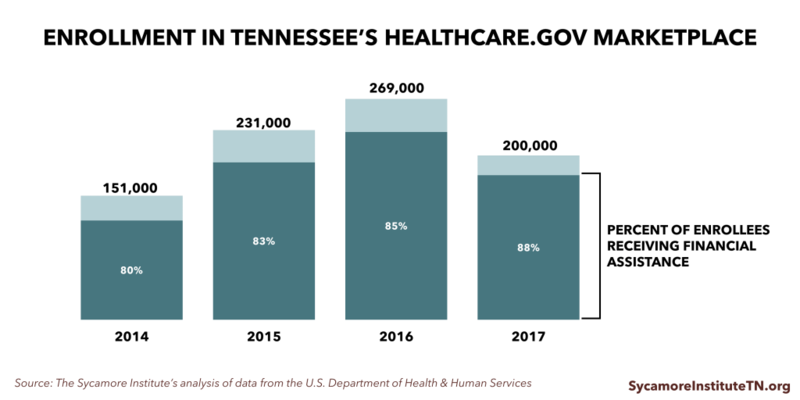 In Tennessee, premiums more than doubled between 2014 and 2017 to become some of the highest in the country this year. As a result, 2 insurers faced unacceptable losses in their healthcare.gov products and left the state’s Marketplace, and the co-op plan created under the ACA to serve the Marketplace closed down entirely. According to the Tennessee Department of Commerce and Insurance, 3 insurers are tentatively willing to participate in Tennessee’s Marketplace in 2018 (Figure 3). Most areas will have access to only 1 insurer. Blue Cross Blue Shield’s proposed rates are on average 21% higher than in 2017. Cigna’s proposed rates are 42% higher on average. Oscar Health (a new entrant) has proposed rates that are, on average, lower than those proposed by the other insurers. Some analysts, however, believe Marketplaces are stabilizing.2 They argue insurers lost money early on because they lacked sufficient information about the characteristics and costs of the people who would enroll. Enrollees in Tennessee’s Marketplace had the 3rd highest “risk score” (i.e. expected costs) of any state in 2015, according to a recent analysis.3 This suggests the lower premiums in the early years of Tennessee’s Marketplace were not sized to cover the actual costs of enrollees. Insurers’ margins in the Marketplace have since improved, suggesting the more recent, much higher premiums come closer to covering enrollees’ costs. What Could Tennessee Do to Stabilize Its Individual Market? A federally-funded, state-run reinsurance or high-risk pool program could help reduce premiums in the state’s healthcare.gov Marketplace by insulating insurers from the costs of covering high-risk individuals. Federal funding for state-run reinsurance and/or high-risk pool programs is available under current law, and the Trump administration has encouraged states to apply for it. Alaska recently became the first state to get approval for federal funding of its reinsurance program beginning next year.4 Each approach has its trade-offs (read a thorough discussion of them in our Reinsurance & High-Risk Pools piece), but they may help to make insurers’ risk more predictable. Prohibiting lower-premium individual market plans that do not comply with ACA requirements might reduce premiums inside the Marketplace. These less expensive, less comprehensive plans attract younger, healthier individuals who keep risk pools broad and diverse and therefore more stable. The trade-off is that this would limit choice and likely increase premiums for people who currently have non-ACA compliant plans. The Obama administration in 2014 gave states the discretion to allow individuals to keep non-ACA compliant plans purchased after the ACA became law but before it took effect. These “transitional” or “grandmothered” plans are currently allowed through the end of 2018. Tennessee is one of the states that allows transitional plans. Tennessee does not classify certain plans offered to Farm Bureau members as insurance. As a result, these plans do not have to comply with ACA rules like the essential health benefits and the prohibition on setting premiums based on a person’s health status. Tennessee appears to be the only state with this type of exclusion6, which allows healthier individuals who might otherwise enter the Marketplace to retain lower premium, skinnier benefit plans. Individuals who purchase these plans don’t get federal subsidies and must pay the ACA’s individual mandate penalty. Again, there are trade-offs to consider. Disallowing transitional and other non-ACA-compliant policies would end some healthier individuals’ access to lower premium, less generous plans, but it could drive these individuals into the Marketplace for coverage, which may lower Marketplace premiums. Expanding TennCare eligibility — in whole or in part — might help to reduce Marketplace premiums. Two recent studies found that states that expanded Medicaid eligibility under the ACA have healthier Marketplace risk pools and lower Marketplace premiums than non-expansion states.3,7 The lower-income populations that would become eligible for Medicaid under expansion tend to be less healthy and cost more than the Marketplace population. In non-expansion states, the sickest among them sign up for Marketplace coverage while the healthier tend to go uninsured. This makes a state’s Marketplace risk pool more costly, which drives up premiums. The trade-offs of expanding TennCare are that it would increase federal Medicaid spending and TennCare’s administrative burden. The extent to which Tennessee might face increased state expenditures for the expansion would depend on the financing structure (e.g. use of hospital assessment fees, the federal match rate). 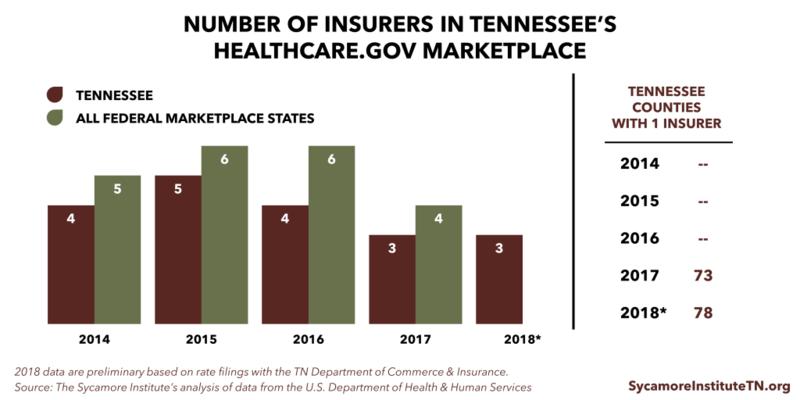 It is worth noting that, while state actions have the potential to improve Tennessee’s Marketplace, insurers face uncertainties that are outside the control of state policymakers. One example is enforcement of the ACA’s individual mandate. The individual mandate requires that every individual purchase insurance or face a monetary penalty. 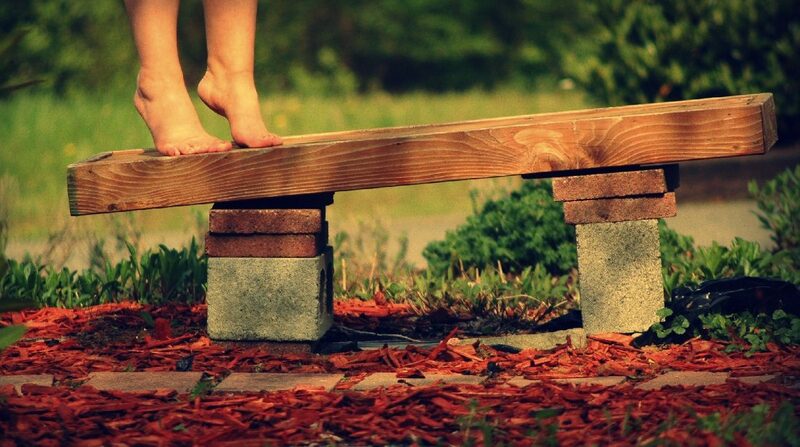 It is designed to increase participation by younger, healthier individuals, in support of a broad risk pool. The U.S. House and Senate bills would have eliminated the individual mandate but replaced it with continuous coverage provisions that seek to accomplish the same goal. Without a strong incentive for lower-risk individuals to buy insurance, the individual market is at risk of becoming increasingly unstable. Although the mechanism is politically divisive, federal enforcement of the ACA’s individual mandate is one effective tool for helping to broaden risk in the individual market in the absence of an alternative mechanism. The ACA (like its alternatives) represents a distinct set of trade-offs that can be politically divisive. If Congress is unable to reach consensus on legislative changes to the ACA, however, it will remain the law of the land. 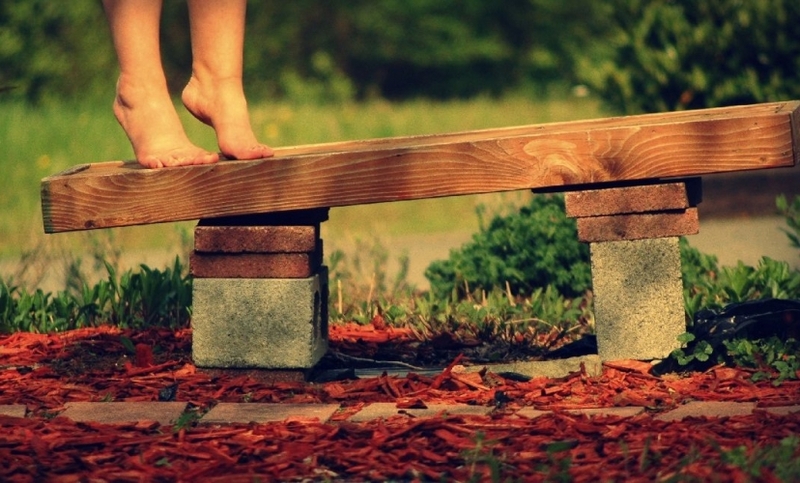 Given the uncertainty over Congressional action, state policymakers should consider the tools and trade-offs available under current law that could improve Tennessee’s individual health insurance market.